The situation regarding the volcanic eruption in Iceland remains dynamic and the latest information from the Met Office shows that the situation today will continue to be variable. Based on the latest Met Office information, part of Scottish airspace including Aberdeen, Inverness and Edinburgh airports will continue to be available from 1300-1900 today, and also south to Newcastle Airport. Restrictions will remain in place over the rest of UK airspace below 20,000ft. Overnight the CAA, in line with new guidance from the International Civil Aviation Organisation (ICAO) decided flights above the ash cloud will be permitted in the UK; between 1300-1900 this will enable aircraft movements above 20,000ft in UK airspace. The Met Office uses multiple dispersion models endorsed by the international meteorological community. The output from the Met Office volcanic ash dispersion model has been compared with our neighbouring VAACs in Canada and France since the beginning of this incident and the results are consistent. • Met Office and NERC aircraft have observed volcanic ash in UK airspace at varying heights. • Multiple land observations have recorded ash in the skies across the UK, including across southern Britain. • Balloon observations have shown a 600 m deep ash cloud at an altitude of 4 km across parts of the UK. NATO F16 fighter jets have reported engine damage, due to volcanic ash when flying through European airspace. It is for the aviation industry and regulator to set thresholds for safe ash ingestion. Currently, world-wide advice from ICAO is based on engine and airframe manufacturers stating a zero tolerance to ash ingestion. This means that aircraft should not be exposed to any volcanic ash. A proposal by Eurocontrol, the intergovernmental air traffic body, to European transport ministers suggested the implementation of a no-fly zone limited to the visible ash plume as determined by satellite images and adequate buffer areas which could be updated on a six-hour basis. 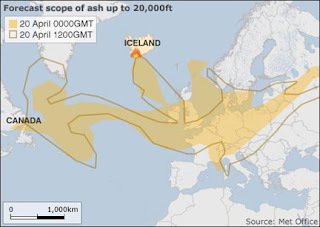 The current map of the ash that the Met Office has produced shows that there is a way of getting from the US to the UK without going through the cloud, but only as far south as Newcastle. There are moves to do a better job on predicting where these flight paths would be. While planes can now fly over the UK, it is getting down through the space below 20,000 ft that contains the ash that is the problem, and you have to do that if you are landing or taking off. But it also shows how the ash has put a barrier between Northern and Southern Europe. After the height of the cloud being produced had reduced over the past few days, there was hope that it was not getting high enough into the atmosphere to reach Europe (i.e. below 3 miles). The latest outburst, however, put more material higher into the atmosphere strengthening the cloud once more. I wrote yesterday about the size of the particles, and why those that are in the 50 – 100 micron range are particularly dangerous as abrasive cutting threats to aircraft. Smaller particle sizes, around 5 microns, are the greater personal threat, since these very small yet sharp particles can be breathed into the lungs and do damage, both chemically and mechanically. Larger particles fall out of the cloud fairly rapidly but the smaller particles, which are formed both from the contact of the molten lava with water and ice (which causes it to shatter) and from the bursting of bubbles of gas that are being emitted within the molten rock, and burst as it reaches the surface, are the ones carried higher both by the relative heat of the plume, but also by the prevailing winds. 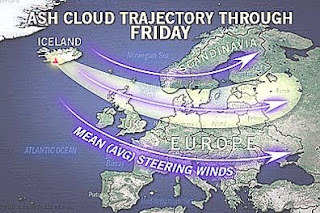 Part of the problem that is sustaining the cloud has been the warm weather with a fairly steady wind direction although this is swinging south, with the predictions through Friday suggesting that the cloud may intensify while narrowing. There is some hope that an increase in wind speed could displace and disperse the ash already over parts of Europe confining the restricted zones (which sadly seem likely to include the airports of the south of England) to a narrower band. The projected path of the wind does seem to vary with forecasters, this is from Accuweather, which has the cloud sweeping back north over Scotland, and moving away from the southern airports, while the Met Office view (above) has the cloud further South and covering them. Winds at the level of the ash plume are also expected to become more aligned Tuesday into Wednesday, which may result in the ash plume becoming more concentrated and posing a greater threat to air travel. This, of course, is assuming the volcano continues to erupt through then. On a positive note, AccuWeather.com meteorologists expect this greater alignment of the winds to cause the ash plume to become narrower and affect a smaller area. Due to the ash plume from the volcano that erupted in Iceland, some of American Airlines operations have been disrupted. Ticketed customers whose flights have been cancelled are being re-accommodated on other American Airlines flights with available seats. If a customer whose flight has been cancelled decides to cancel or reschedule their trip instead of continuing travel, that customer is eligible for a refund on any unused portion of their ticket. In addition, American offers customers whose flights have not been canceled, but who are traveling to or from the impacted areas in the next several days, the convenience to change their plans. Ticketed customers may change flights as shown below, without incurring a charge for changing their tickets. In essence the “shown below” says that passengers who booked flights before April 16th, and who plan to fly between the 16th (when this started) and the 22nd (Thursday) can change tickets without penalty only if they rebook their flight to occur before May 3rd. Part of the problem with that is of course no-one knows how long this will go on, and in my own case I have to be back here by a certain date, and so am a bit restricted in my options. (Oh, and they only allow one re-booking).